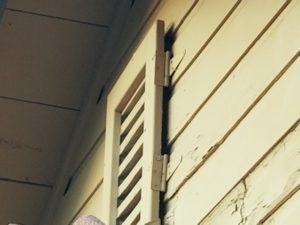 Attic entry points, attics can and do cause a lot of issues. We often forget that our attics exist. Especially at Christmas time when we bring down boxes etc. and find that mice or pest have invaded. Reminder – always open boxes in garage, that way when something pops out it won’t be in the house. 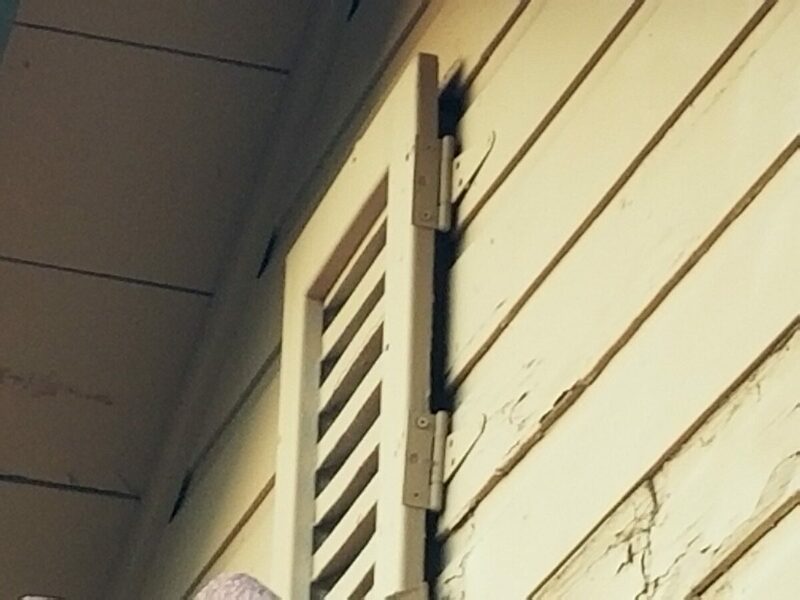 Most people are aware if there home has holes leading into the attic area, but what about hidden ones? The people that build you home cut out the hole that the appliance must fit through. But they make that hole bigger and that is where the issue stems from. Scorpions can fall through those holes, as well as other bugs. I’m sure you have noticed a scorpion in the tub, they can’t crawl up the sides and probably fell in from the ceiling. BurrowRx underground rodents. 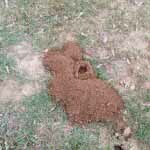 Do you have underground rodents (rats and mice), ground squirrels, pocket gophers, gophers, moles or pack rats? We have the solution to their constant burrowing, damaging of plants and holes which people and kids can fall into. 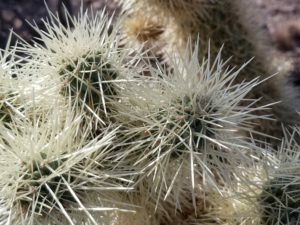 Another issue that can occur is that these rodents are prey to rattlesnakes and other more harmful creatures. If they are present it may encourage snakes to wonder into and on your property. The BurrowRx Rodent Control Device is classified as a pesticidal device. Secondary kills of nontarget species is not likely when used as directed. When the Carbon Monoxide dissipates there’s no longer a risk to anything entering the burrow system. It uses a smoke tracer to let you know where the carbon monoxide is going. It’s your prescription for any burrowing rodent problem. Carbon Monoxide can be used as an effective approach to control of burrowing rodents. As the Carbon Monoxide enters the burrow system, the rodent breathes it in. The Carbon Monoxide then replaces the oxygen in their blood. And without oxygen, cells in the body die and organs stop working. Customers with pets love the BurrowRx underground rodents because there is no worry about primary poisoning by digging up poisonous bait, or secondary poisoning from gophers that have previously taken poisoned bait. Data efficacy is very effective at 95% at controlling borrowing ground squirrels. Direct targeting of rodents within the burrow system. No reliance on bait acceptance that sometimes hinders rodenticide and trapping efforts. Our solution eliminates the worry about secondary or unintended kills. It seldom requires handling of animals after treatment, which reduces the risk of disease and parasite transmittance to humans. Allows you the customer to see that the technician and product is working. Our commercial business approach is professional and builds customers’ confidence. It can be highly efficacious. 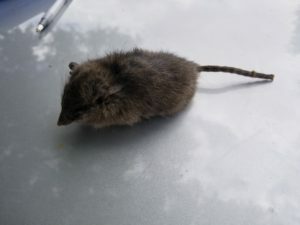 Desert Shrew – this little guy eats invertebrates such as worms, spiders and insects, but it also eats lizards, birds and small mammals such as mice. They hunt at night, restricting themselves to areas with thick brush to avoid owls and other predators. They rest in the burrow of another animal during daylight hours. In the hottest part of the day (Arizona 120), the shrews enter a torpor – an inactive state similar to hibernation and so would I. They prowl and search for their prey at night, so it often falls victim to nocturnal hunters such as owls and snakes. Beep beep where is the Coyote? 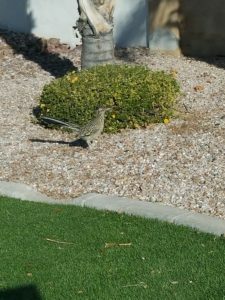 So we all know as kids that the Roadrunner would always outwit the Coyote. I often just once hoped that the Coyote would catch the Roadrunner. I also still think Acme tools are the perfect tool for catching those unwanted pests/animals. Have you ever tried an anvil on an pest/animal? You know who would be on my case, right? My favorite was the train, where he painted the hole in the side of a mountain. We also knew that all this was just a show, we figured out fast that the poor coyote would be back. I still felt sorry for the poor guy. How about you? This entry point – I couldn’t see this opening really well, but was sure something could gain entry. Could it be a bird or a rodent? 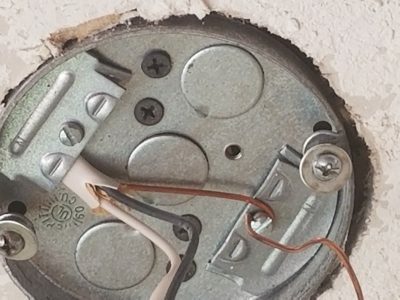 This opening in the attic is important to annual checks. 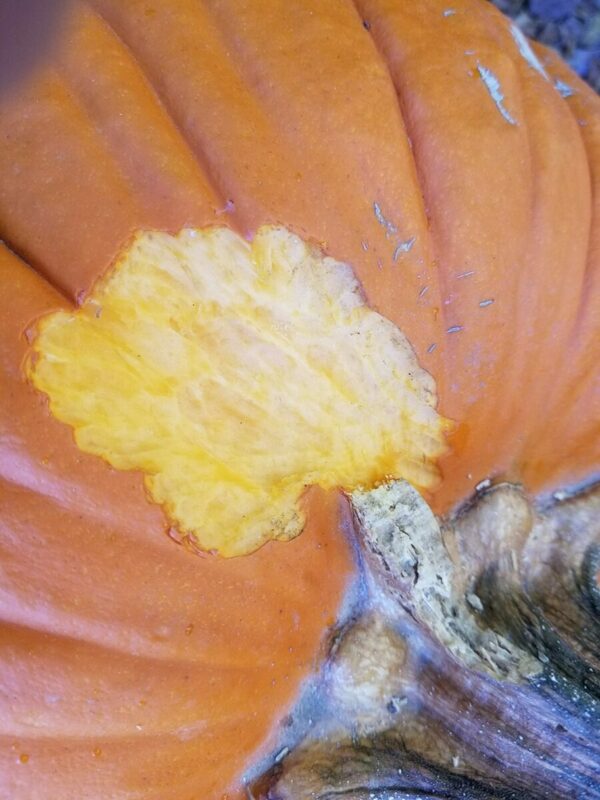 I would be concerned just looking at it but still needs to be sealed tighter to not allow unwanted guest. At least the door was closed but what if it was open, who would check and who might be able to close or lock it? My opinion is that this is a perfect opportunity for rodent activity. The minute that mice or rats get into this space opens the chance for bacteria, urine and feces to become part of this home or business. Mice urinate while on the run and feces may be spread throughout the space. Annual checks is what I’m saying, top on my list. 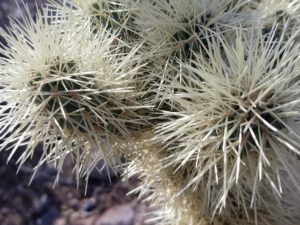 Jumping Cholla – If you live anywhere in the desert you know about these cactus. They will attack if you get close. OK they won’t attack but it seems like it. Its like they are magnetic. But a question was asked recently why don’t rodents or coyote’s ever have them attached? Or better yet why not Pack Rats? It’s called behavior modification, they learn and they learn quickly. 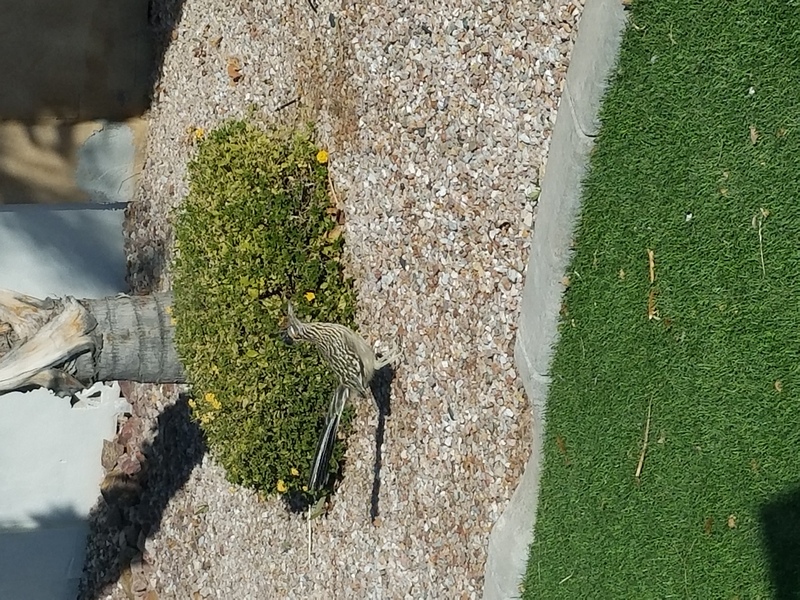 It’s amazing cause almost every time I’m in the desert I get a few. I kneel to check a rodent station and get one in my knee or there might be bits and parts inside the bait station. 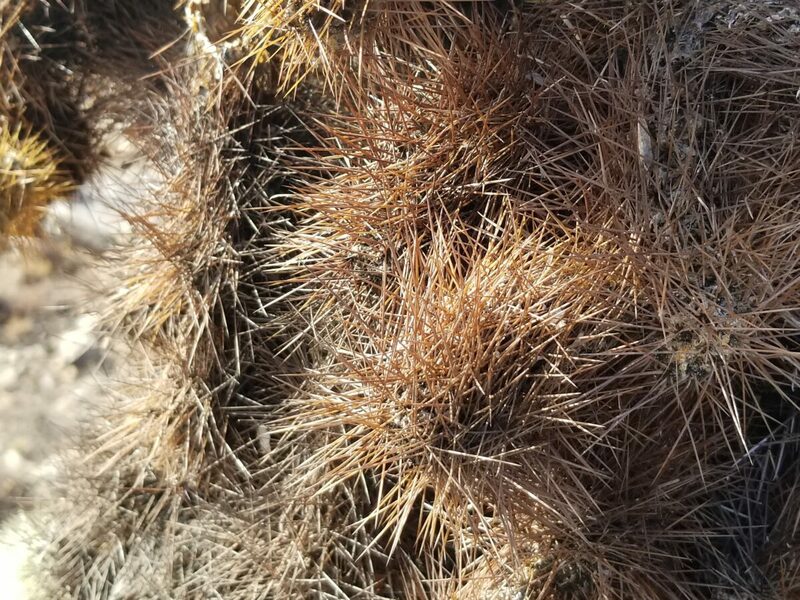 Sometimes I even get them in my shoes, right through the soles and you think its a rock but surprise a needle shooting pain. So a word of caution, there are many things in the desert that can do you harm, rattlesnakes, Africanized Honeybees, rocks and cacti – so use extreme care. I seem to find almost all of these dangers as I’m doing my work. Stay tuned for a resent find in a rodent bait station. 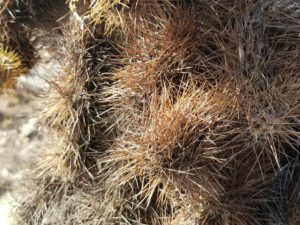 I have seen Pack rat middens or dens full of this stuff, how do they do it – I have no idea. I was training a technician once and mentioned to be careful, I had no sooner turned around and he had them from toe to waist on his right leg pants. Painful and barbed, did I say ouuuuuch? But yet the animals seem to be impervious or maybe it’s just that they are smarter. You decide! 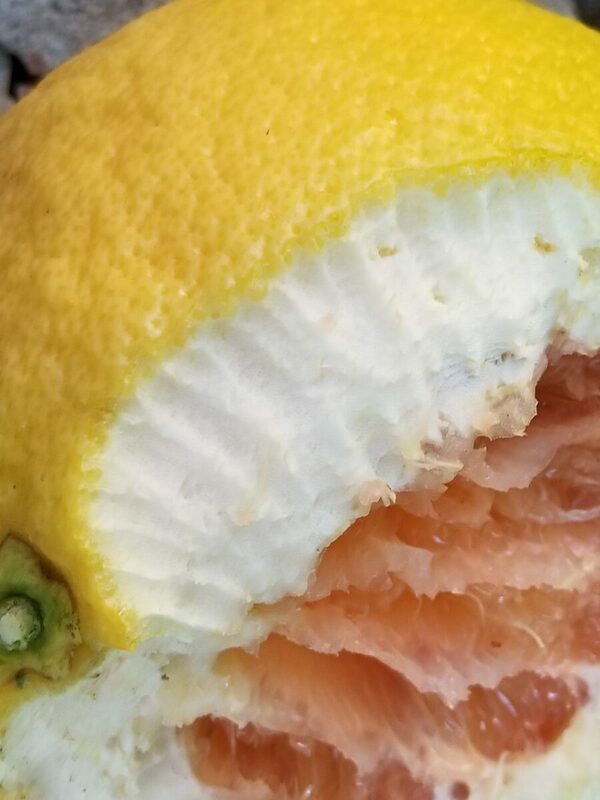 Somebody is eating the fruit. 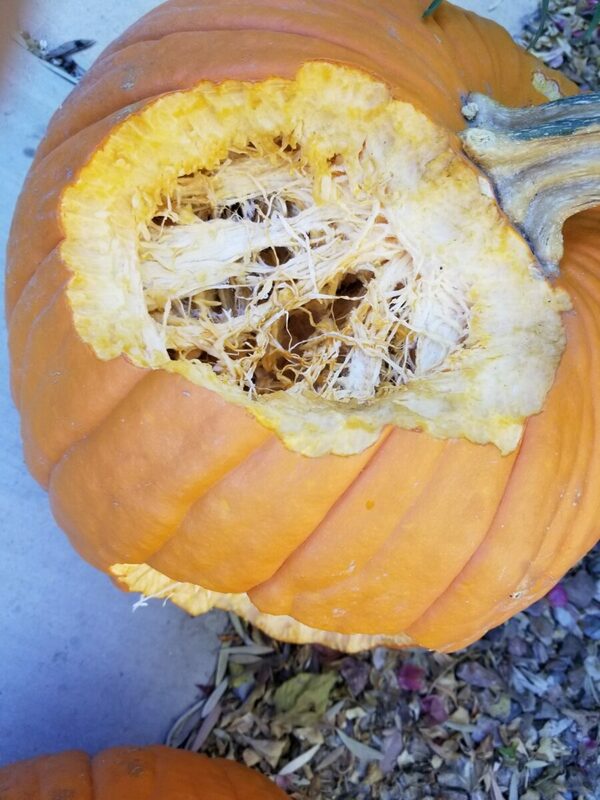 I think it’s rodents eating the grapefruit and pumpkin, when you make it easy for the animals/wildlife the next step is entry into your home. I tell everybody, it is extremely important to pick up the fruit that has fallen. No sense feeding any unwanted pest from the neighborhood. Unless of course that is your idea. I know birds will also eat the fruit but uninvited pests are sure to show up. Oranges, lemons, limes and left over pumpkins are open season for any animal or wildlife. Rodents are prolific breeders and require a lot of food to raise their young. 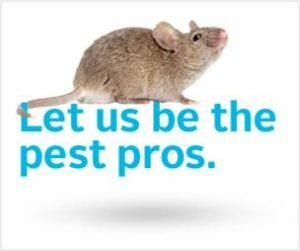 Essential to the control of rodents, eliminate harborage or shelter, reduce water and eliminate food sources. If you can control these factors the rodent population should be controlled. 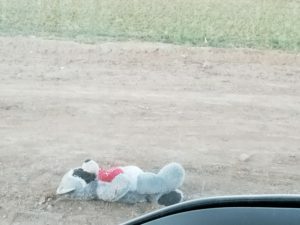 Raccoon plush toys – The things I see? Stuffed toys raccoon etc. I’m on the road a lot and I encounter some really scary things, I was at a house one day when I heard a loud crash. I ran down the street and saw two young girls on the street involved in and accident. They attempted to cross the road and not at an intersection, I later heard that one of the young girls had died. 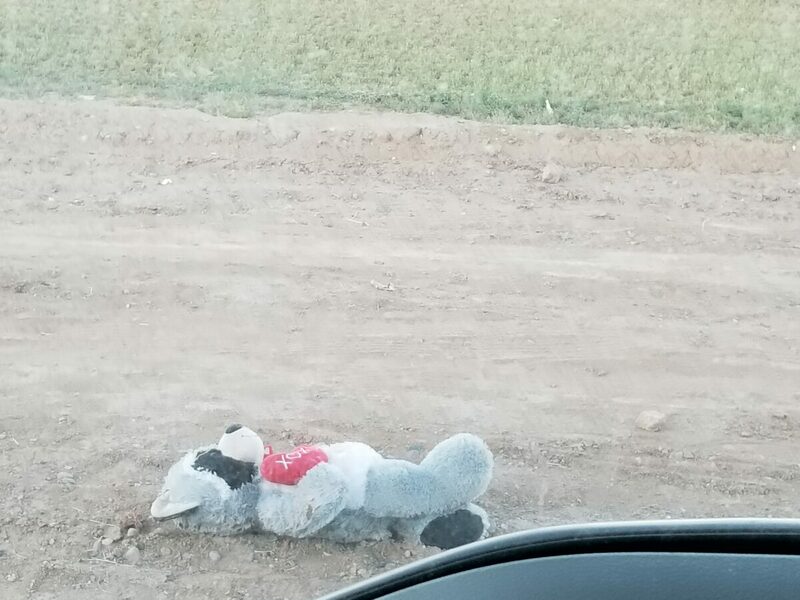 This is just a stuffed critter Raccoon that someone has discarded on the side of the street. I just don’t understand how people can just toss stuff from their cars. People have to clean this stuff up and guess who pays for this – you and me in taxes. Can you only imagine the terror, what would your dog do? Or for that matter what would your children do when they encounter the squirrel? Well I guess most of us don’t want to think about what that outcome could be. But it is something to think about, right? 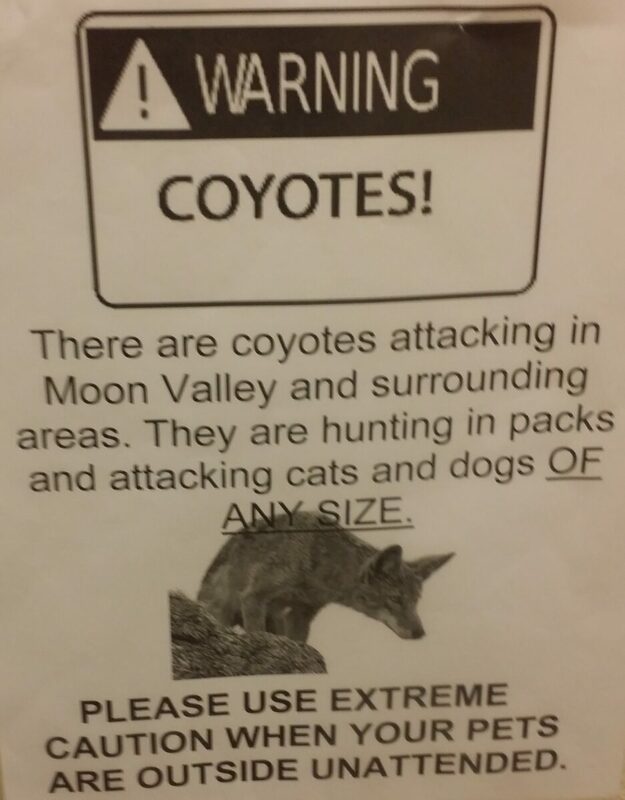 I saw this wildlife warning the other day at the Vet’s Office, they can indeed be on the lookout for food and your pets could be that meal. 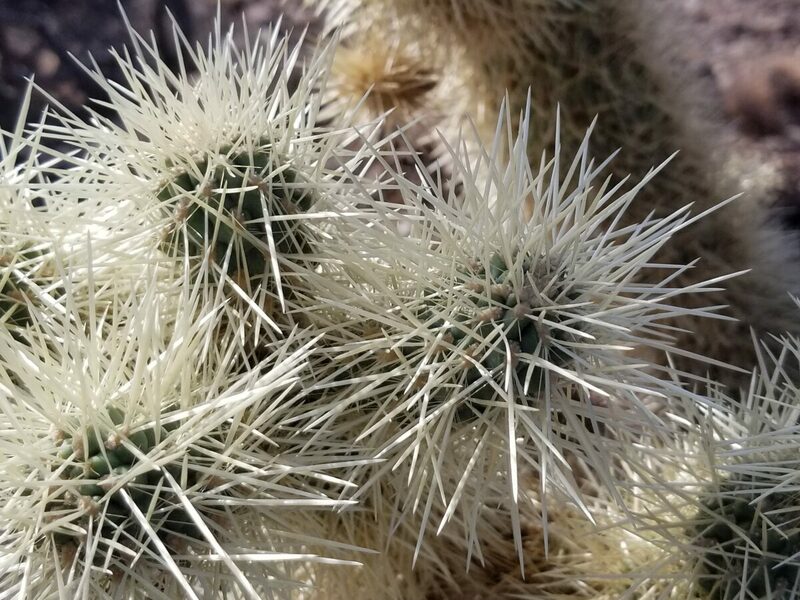 Other wildlife can carry disease and also attack, squirrels can be quite aggressive if they are hungry and of course Javelina’s can also be temperamental when cornered or frightened. This is also the season in AZ for rattlesnakes and spiders so please guard your pets and children. Animals often look all crudely and those looks can be deceiving, they can turn on you in an instant. 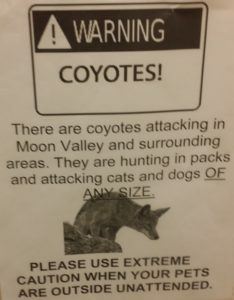 If that animals bites you and you can’t locate it, you may have to have those rabies shots and those are scary. They can also be dangerous for pets, coyotes can jump fences and birds of prey can swoop right on in and grab a small cat or dog.